Walking into a church for the first time can be pretty scary. Churches aren’t very good at making people feel welcome. 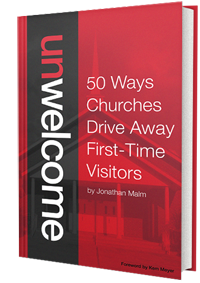 Which is why I’m proud to be part of the new book, Unwelcome: 50 Ways Churches Drive Away First-Time Visitors by Jonathan Malm. It helps churches realize where they’re dropping the ball and scaring people away, whether it’s over-eager greeters hugging people (yikes!) or a cold congregation reserving seats (icy!). Jonathan offers practical tips and ideas, drawn from his vast church experience. He’s got funny stories that make the medicine easier to swallow. You can grab some sample chapters at UnwelcomeBook.com to get a taste. This is the first CFCC book I didn’t contribute anything to, but I did handle the editing, proofreading and I’m very involved in the marketing. Rather than being bummed I don’t have my name on the cover, it’s kind of cool to see other folks’ stuff getting out there. Jonathan has a lot of great insight and experience (this is his fourth book this year alone!). I was also thrilled to get Kem Meyer to write the foreword. We’re also doing a big push this week only, so if you’re interested in Unwelcome, grab it now. The digital version is $7.49 and the print is $9.89, this week only. Next week they’ll go up to $9.99 and $12.99 respectively.